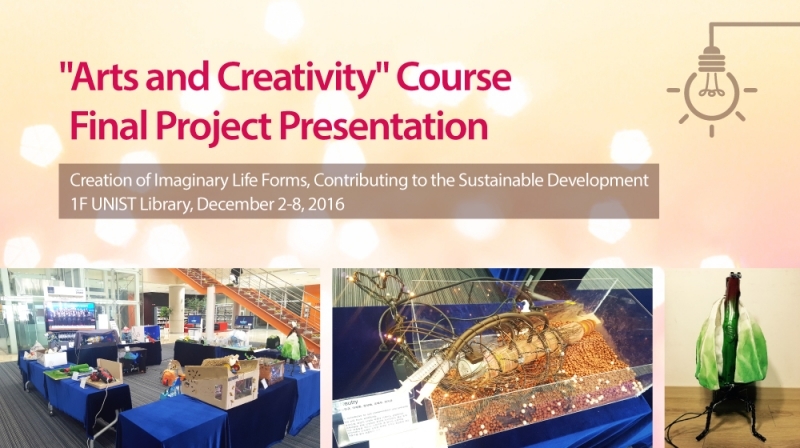 "Arts and Creativity" Course Final Project Presentation, December 2-8, 2016. "Creating Imaginary Life Forms that Contributes to the Objectives of Sustainable Development"
Arts and engineering students in the “Arts and Creativity” course will be presenting their final art projects in the lobby of UNIST library from December 2 to 8, 2016. The goal of this educational collaboration is to work collectively to create a “imaginary life forms” where the aesthetics and design of the art object act in a manner that best contribute to the objectives of sustainable development. “It was probably the most meaningful experience of my life, as this is the first time I have created something out of imagination,” says JiHyun Lee, second year student in Energy and Chemical Engineering. “We are honored to showcase our final projects to the general public as part of our art project”. The art project, presented by JiHyun used a plant, called the Venus Flytrap as a design motif, which later made into a life form sculpture, digesting plastics. The idea was based on new research from Stanford Unviersity that the bacteria inside the mealworm’s gut can digest plastics.